When my husband were house hunting a few years ago, we sometimes got into arguments about the house to buy. After weeks of searching, we found one that we could agree on, and we’ve been mostly happy with it. First of all, you each need to figure out what your “must haves” are in a house. Almost anytime you make a big decision with your significant other, compromise is involved. However, you need to figure out what your deal breakers are ahead of time, and communicate those. That will make it easier to find a living space that has at least one must have feature for each of you. My husband and I didn’t start our own house hunting adventure on the same page with regard to cost. He was looking at houses that cost more than I wanted to spend. A little more than a week into the process, when he realized I was grumpy about the whole thing, we hammered out how much we wanted to spend. Once we were on the same page (spending a little more than I wanted, but less than he wanted), things went smoother. Figure out what you want to spend ahead of time, and things will go smoother. If you are getting help from a real estate professional, make sure you present a united front. Don’t agree to something unless you and your partner have agreed to it ahead of time. Figuring out what you want to pay ahead of time, and then standing together about it can also prevent a real estate professional from wasting your time with homes or rentals that are more expensive than you want to pay. When possible, look for living spaces together. Search online to find potential candidates together. You should also try to tour the possibilities together so that you can both form an impression. That way, you won’t end up with one of you unsure of what you are looking at, and one of you doesn’t have to rely on the other to make a decision about the home. 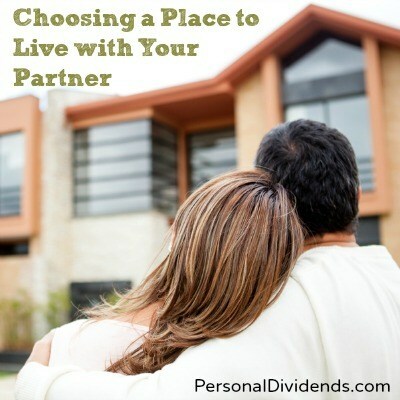 It helps for you both to go through and decide what you like and dislike about a living space. You should talk about the options once you have seen them. Each of you should share what you think are the pros and cons of a living space, and create a list. It can help to make a top 5 list of your favorite spaces. If you both of a couple of the same spaces on the list, those can be your final choices, and you can talk about them. If you talk about the process as you go through it, you will be more likely to find something you can both deal with — and perhaps even something that you both love.